Bootlegger’s Cove is a Lake Ontario Marina located at N43*19’ W78*50’. We are in the western end of Wilson Harbor, at the mouth of East 12 Mile Creek, across from the Tuscarora State Park Launch. 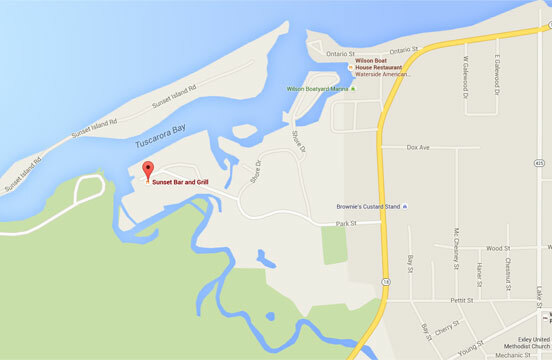 Our address is 6 O’Connell Island, Wilson NY 14172. Bootleggers Cove Marina is owned by long-time resident and entrepreneur Michelle (Shelly) Elia, a mainstay in the Wilson Harbor community as the owner of Wilson Boat House and Sunset Grill as well as Chopped Lovin’ (the top deer processing facility in western NY). Shelly saw an opportunity to bring new life to the harbor by purchasing and renovating the old Sunset Bay Marina. 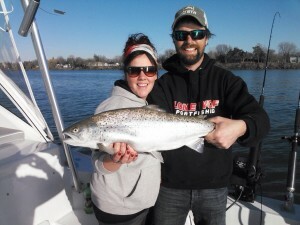 With her husband Danny Evans (owner of Lone Wolf Sportfishing), she decided to launch an entirely new Lake Ontario marina experience that would wow both fishing charter captains and power boaters and help make the Wilson Harbor an even more exciting place. Since purchasing the 26-acre facility in September 2014 they’ve successfully completed major renovations, with many more to come in 2015/16. Shelly and Danny pride themselves on offering a unique combination of fun with a fanatical focus on customer service and professionalism. They know how to show guests at Bootleggers Cove (as with all of their businesses) an amazing time as well as provide top-notch services. You can expect only the best from the entire team at Bootleggers Cove. Storefront with new office space for the marina and Swann marine. The storefront will carry a line of boating supplies this season featuring Harbor Rat Supply Co.
Marine Upholstery and Canvas will be setting up shop inside our facility. Our beloved travel lift, forklift, and tow motor are being rebuilt and painted. All marina docks are being rebuilt and re-decked.